So, I don't know if you've been paying attention, but I've mentioned a couple of times lately that comment spammers have been hitting sheppybrew.com pretty hard. The way it started out was really quite strange. You see, I have always allowed anyone to comment on SheppyBrew.com (well, since I programed comments into the site). But since very early on, any comment that contains an html href link in the body must be manually reviewed and published by me. So, really, a comment spammer trying to get their urls out there has no motivation to try to spam SheppyBrew.com. Over a few days, the spammers (at the time I didn't realize they were Tweedle Beetles) started posting a bunch of random weird comments to the site. These comments didn't contain any links, so they were just automatically added to the site. And, quite frankly, it didn't hurt anything. It was just sort of aggravating (and strange). You may remember that every comment to the sheppybrew.com site used to get tweeted on twitter (via twitterfeed.com). So, anyone who was following me on twitter during those few days probably thought I was having a really weird conversation with myself. Actually, I don't think anyone really follows me close enough on twitter to have even noticed, but still. Again, it didn't accomplish anything other than aggravate me. That phase of the attack ended shortly after I changed my twitterfeed configuration to stop tweeting the comments. 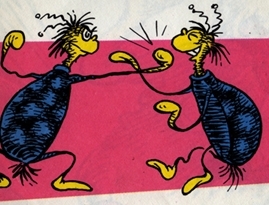 Do the Tweedle Beetles watch for my tweets? Apparently they do. Maybe they are just as obsessed with me as I am of them. Then, they started spamming the site by putting urls in the comments without html tags. I quickly put a stop to that. Then, they went back to the standard posting of comments with html href links. And I've mentioned, those end up in my database and I get an email telling me to review the comment, but they never end up on the site unless I manually update the record in the database to publish. So, again, the only thing that the Tweedle Beetles are accomplishing is to aggravate me. And to make things weirder ... none of the urls actually go anywhere. Well, I have not checked them all, but I have been spot checking with Godaddy to see if these are registered urls. And so far, none that I have checked are even registered. I could have bought any of the domains right then and there and have the Beetles work for me. Well, this blog post is getting long and I am sure you are all already bored. But the story isn't yet finished. What have I done to combat these little T-Beetles? Why am I so sure it is the Tweedle Beetles spamming me? To answer these questions and more, stay tuned for part II of the not-so-exciting "Tweedle Beetles Return" series. Sheppy - I get the feeling that there are some individuals or organizations that do not like beer blogs and try to hack their way in and ruin it for us beer bloggers. I constantly get direct messages on Twitter from people saying things like - "look at this - I thought of you" or "this is a funny picture with you in it". That type of thing. I purposely turned on moderate comments for every comment that comes across my blog. They rarely even bother to post there. They are now going after Facebook and Twitter. Sadly, I thing commenting on blogs is a slowly dieing trend. More and more people just want to use Facebook and Twitter and Google+ to leave comments. That's why I'm focusing more on those as an extension of the blog. Facebook especially. You might want to consider turning on comment moderation and approve every single comment. That will drive spammers away quickly. But yes, don't be fooled by links on Twitter or Facebook messages. They can be very clever. Well, Dave, you mentioned turning on the moderation before. Again, I'm not having the problem on this blog. The issue is on a non-blog website (http://www.sheppybrew.com) and basically, moderation IS turned on for every comment with a link, and these spammers don't really care. They keep trying despite the fact that their comments never show up (other than the strange temporary anomaly I described above). Stay tuned for the next blog post for additional weirdness about what is happening. I don't really get much response from twitter. People are not interested enough in me to follow I think. I do get decent response from facebook (sometimes), but that is only from my facebook friends as I don't have a facebook "page" for this blog. Maybe I should set on up. Anyway, thanks again for reading and commenting. Lately, you are the only one who has. I guess that sort of makes your point about people not commenting on blogs.